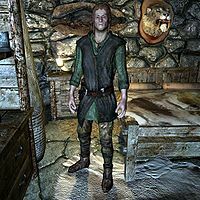 Sirgar is a Nord citizen living in Stonehills. He is the son of Sorli the Builder and Pactur, the maintainers of Rockwallow Mine. He sleeps in Sorli's house every night between 1am and 9am. At 10am he starts carrying lumber back and forth between the smelter and the porch and keeps going until 2pm. The rest of the afternoon and the entire evening is spent inside the house, relaxing, cooking, eating, or talking to his parents. He wears clothes and boots and has an iron dagger equipped. He carries a copy of the key to Sorli's House and a selection of middle-class items and gold. When you approach him, he will comment: "Guess the Empire's going to need plenty of iron what with all the fighting. That'll be good for us, I suppose." He will then direct you to Pactur or Sorli: "Talk to my parents if you need something." He will also inform you: "My parents keep a close eye on the miners. They can't be trusted too much." and "I hear there's been fighting in Skyrim. Rebellion, maybe. Wonder if our iron is being used for weapons." If the Stormcloaks take over Hjaalmarch, Sorli will be appointed jarl and will move to Morthal, along with Pactur. Sirgar will then find himself in charge of the mine, saying: "I'm in charge now that my parents are in Morthal." and "I figured that I would run the mine someday. I just didn't figure that would mean now." From his spot next to Sorli in Highmoon Hall, Pactur will wonder: "We left Sirgar in charge back at Stonehills. I hope that wasn't a mistake." This page was last modified on 7 October 2013, at 15:37.